Noah Bowman, large and in charge. Run 1: Thomas Krief is first in the drop order. He lands a safety run, scoring in the mid 70s. Up next: defending silver medalist Mike Riddle, who surprisingly loses a ski landing his first-hit double cork 12. Pressure will be on for him. Peter Speight of the U.K. crashes on a left 900. Joel Gisler of Switzerland explodes into the pipe with an exciting run, but lands poorly on a double 12 at the bottom. Then Beau-James Wells posts the first score in the eighties: 86.2 with a very solid run and doubles on both walls. He’s followed up by Torin Yater-Wallace who improves on his score by three points. Everyone seems to be landing low in the pipe—maybe it’s those nerves. Simon D’Artois kicks off his run well, but gets a bit wobbly halfway through and only scores a 66. He’ll be looking to improve. Robin Briguet puts down a run including a cork 900 seatbelt japan, until he runs out of pipe on his last switch hit. Aaron Blunck lands backseat on a right dub 12 tail and joins D’Artois in the sixties. Noah Bowman doesn’t have enough juice for his second switch double and has to open up. The next top-shelf competitor to run into trouble is David Wise, who lands too deep on his last right dub 12 and posts a 24.8. Kevin Rolland is having none of it, stomping a clean safety run (yeah, dubs on both walls is a safety run for him) for a score of 87.8. But Alex Ferreira immediately one-ups him, posting 92.6 with a huge right 9 tail, left 7 blunt, switch right 7 japan, left dub 12 mute and right dub flat 9 japan. Rafael Kreienbühl’s got some dubs, but needs to clean it up to make it to finals. 16-year-old Nico Porteous drops a hell of a run, but skips a final hit and is penalized hard by the judges. Pavel Chupa squirrels out on a right 900. 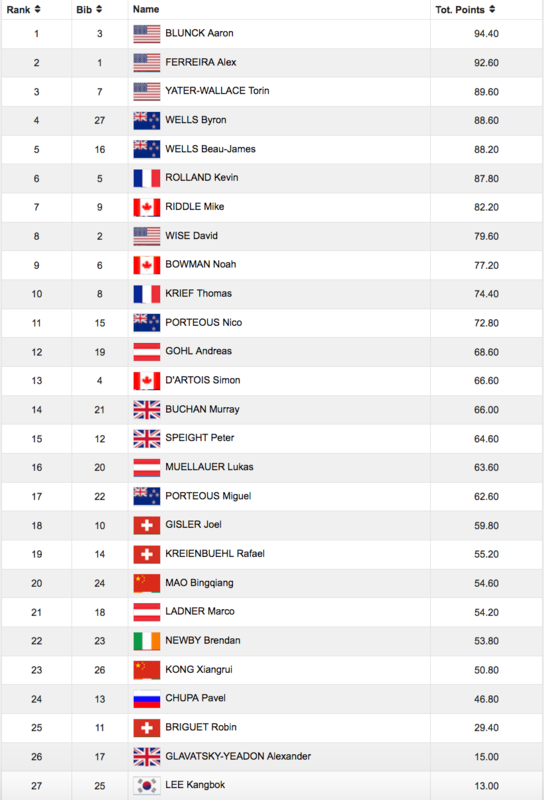 Andreas Gohl puts down a big run for him, a dub 12, some 9s and a switch 7, that puts him within reach of the finals. Lukas Muellauer is looking to be the steeziest mo-fo on the course today, but washes out on a left 10. Hometown hero Kangbok Lee drops in, but can’t hold onto the landing of his first hit dub 12. The British announcer on Eurosport says, “These athletes get so, so high. They go to the stars.” He’s pretty flabbergasted. Byron Wells, beard game strong, pipe game stronger. He’s got the coolest drop-in in the field, jibbing the right wall before dropping into a massive switch double 900. At 88.6 he’s safe for the finals. China’s Bingquiang Mao lands in the fifties. Alexander Glavatsky-Yeadon (say that five times fast) falls on a right 720. Marco Ladner’s into the fifties as well with 5s, 7s and 9s. Miguel Porteous gets backseat on his last hit, a switch 7, and will want to improve. Xiangrui Kong has some 540s and not much more. Irishman Brendan Newby, repping something called “Dinna Time,” comes in high-energy and gets into the fifties. The last rider to drop is Murray Buchan, who’s got double flairs on both walls and scores a 66. Run 1 is over. One more to go to qualify for finals. Currently on the outside, looking in: Nico Porteous, David Wise, Noah Bowman, Mike Riddle. Run 2: Toto Krief goes for broke with a dub 14 but can’t stick it; he’ll ride his first-run score into the finals. Speight lands a run in the sixties to take home and cherish. Then Joel Gisler drops in hot, misses the pop on his first-hit switch double, and takes one of the gnarliest crashes ever on the coping, flipping down into the pipe like a rag doll. He is helped out, shaken. Beau-James Wells improves his score up to 88.2 with another solid run. Torin, sitting pretty with an 89.6, goes for a surf run on the walls of the pipe and caps it off with a steezy cork 5 blunt. Pressure’s on for Simon D’Artois—again, he nails the top section of his run including his stellar double cork 10, but goes way deep on a switch right hit and loses his flow. Robin Briquet loses a ski and won’t improve. Aaron Blunck blasts up to 94.4: right 720 cuban, switch dub 900, sw right 720 safety, left 9, right dub 12 tail and a nosebutter 3 in the flats for the fun of it. And Noah Bowman steps up as well, bagging a safety run for 77.2 to usher him into the finals. “I think she’ll do,” he says. David Wise: pressure’s on. Opts for amplitude, going absolutely massive on his first-hit switch right 7. Gets the left 12, right 10, switch 7, right 9 double tail grab. Safety run, good for 79.6 and the finals. Whew. Kevin Rolland, happy with the results from run one, takes a cruiser lap. Ferreira takes it easy too Kreienbühl loses both skis on a dub 12; he’s done. Nico Porteous posts a 72.8, bumping D’Artois out of the top 12. Pavel Chupa screws up. Andreas Gohl, currently on the bubble, messes up the landing of his dub 12 and will have to wait and see. Lukas Muellauer puts down a run in the sixties. Kangbok lands his dub 12, can’t land the alley-oop flat 3 afterwards. Byron Wells takes a jib run that’s a thing of beauty. Mao can’t get out of the fifties. Lavatsky-Yeadon doesn’t have it either, nor does Marco Ladner. Miguel Porteous fights hard for the finals with a pair of dubs, but only gets to the sixties. Kong does his thing. And Murray Buchan can’t improve. It’s a wrap. Finals are tomorrow.